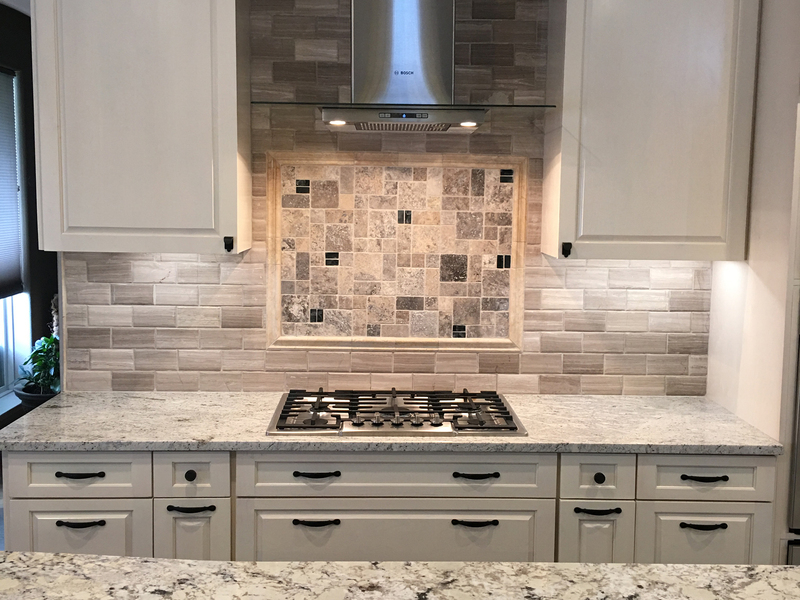 Maddock – Minuteman Design Center, Inc.
Tom and Fran came to us wanting to make their kitchen more updated and functional. The original kitchen cabinets were constructed of oak and were stained a natural color, bringing out the richness of the wood grain. The original cabinet doors were raised panel with the upper doors containing a traditional arch cut. 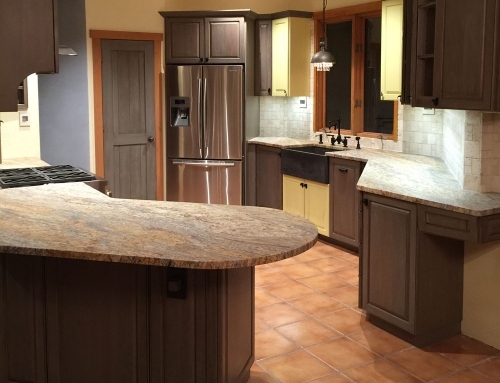 While beautiful in its construction and look, Tom and Fran wanted, not only to change the color of the cabinets, but the layout of the cabinets and they wanted to add an island, so we opted to remove the existing cabinets and construct custom cabinets for them. Tom and Fran wanted white cabinets so it was decided that the new cabinets would be constructed of maple wood. Maple was chosen not only because of the moderate cost of the wood, but also because maple contains minimal grain, which is ideal for achieving a smooth white finish. They also opted to remove the traditional look of the arched upper cabinet doors and replace it with a straight cut, similar to the lower cabinets. 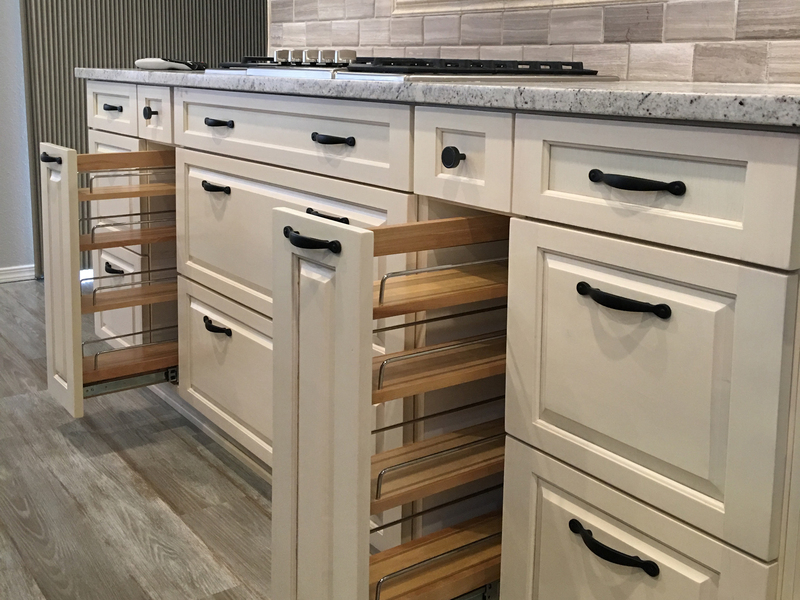 We custom built the cabinets with rollouts to better maximize the space for spices, pots & pans, cookie sheets and similar kitchen items. The spice rack rollout features a soft-close mechanism. The garbage can rollout also features a soft-close mechanism with space for trash and recycle bins. 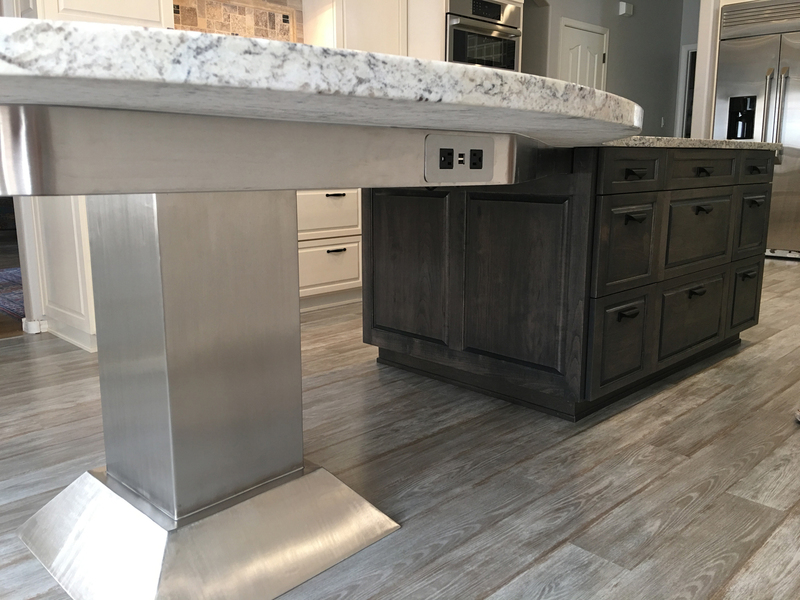 Tom and Fran wanted to go with a dark color for the island, to contrast with the cabinets, so we went with a custom gray color. 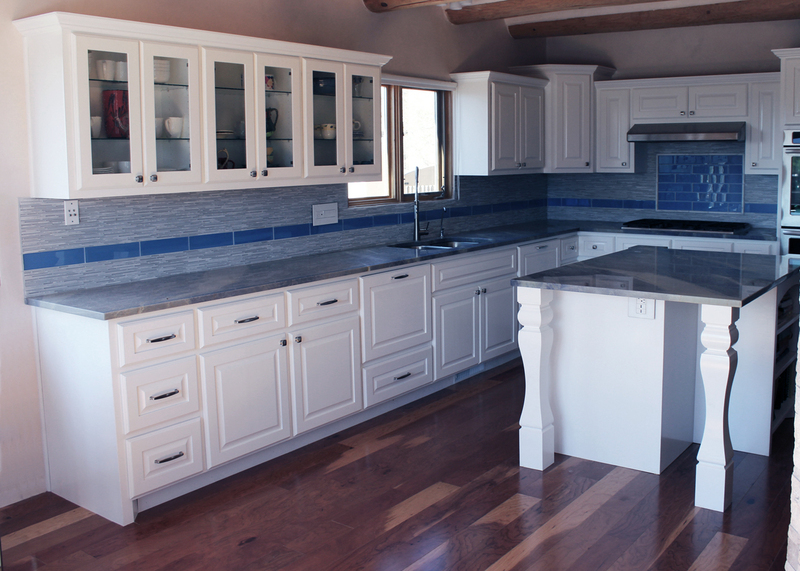 The island was constructed from maple wood and a custom stainless base we designed specifically for their kitchen space. It was created to hold the round area of the granite top which complemented the round windows. The underside of the island was cut to incorporate 2 electrical outlets. The outlets are industrial with a usb slot to make it convenient for charging various devices. The island also has a built-in outlet inside the back of a drawer box which is charging station for the Maddock family’s mobile devices and tablets. The granite is a level 3 stone called White Ice purchased from Arizona Tile. 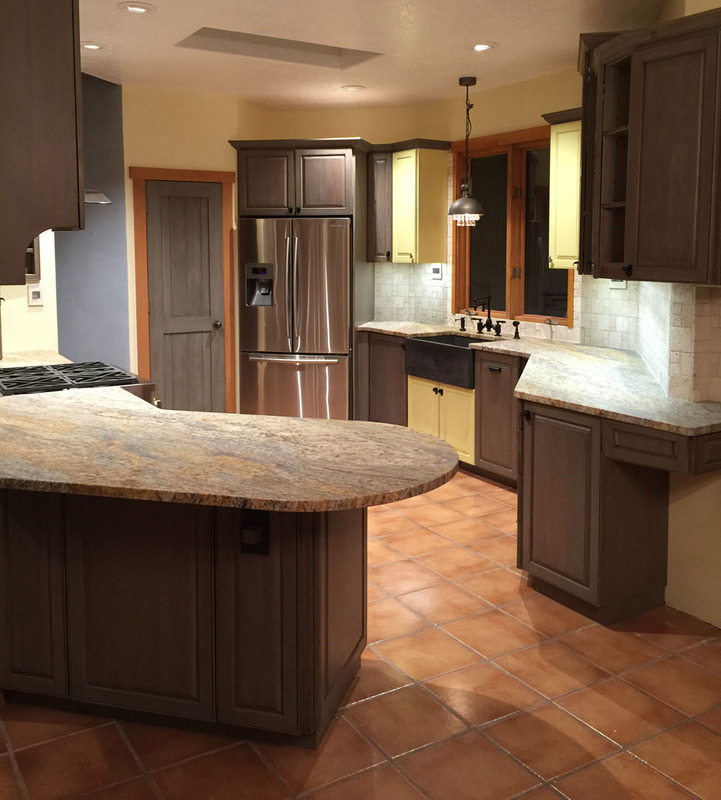 Because of the size of the countertops and island, 4 slabs were utilized. The island was constructed of two slabs which were grain matched for a consistent look. Additionally, the granite was specially cut to utilize the installation of the new farm sink. 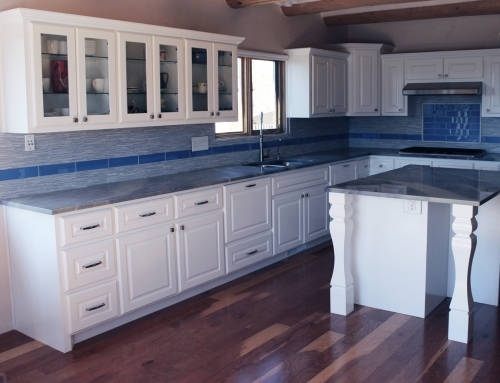 Tom and Fran chose a rustic oak wood floor laminate which complemented the entire kitchen. The backsplash is a travertine tile which was installed as a subway tile. It was sealed due to the porousness of the travertine. Side pencils were used to finish off the backsplash. Tile was purchased from The Tile Shop. Appliances were purchased from Fergusons using our corporate discount. The refrigerator is a high-end GE Monogram counter depth fridge. The other appliances are high-end Bosch appliances. The oven has a swing-door as opposed to an original drop down door. The microwave has a convection feature which acts as a second oven. LED lights were used for the under cabinet lighting, allowing Tom and Fran to save money on electricity but it also contains a cordless dimmer switch which accents the countertops and serves as workspace lighting also. 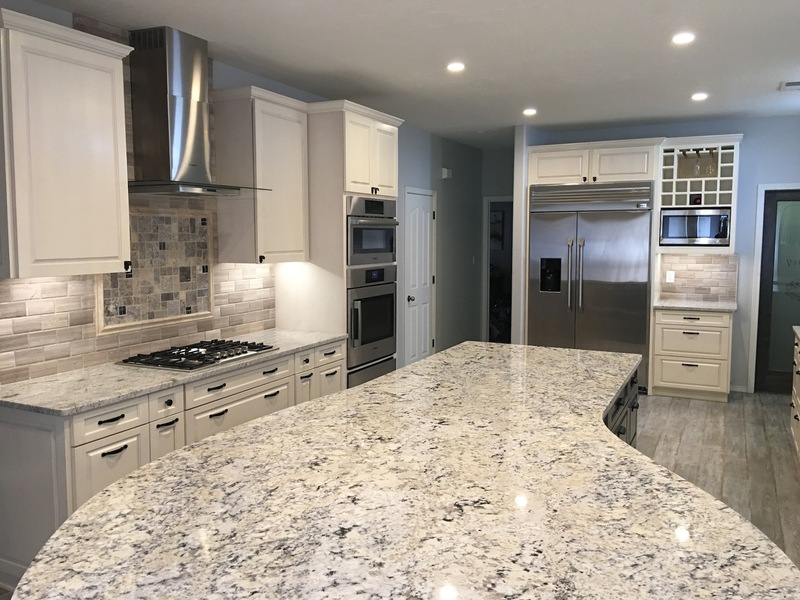 Wanting to replace the fluorescent bulbs, Tom and Fran chose recessed lighting which maximizes the lighting of the kitchen as well as saves energy. The original doors were removed and then installed as pocket doors with a frosted glass front. Each door displays a nice graphic and the name of the room, giving it the elegance and charm of a family kitchen.